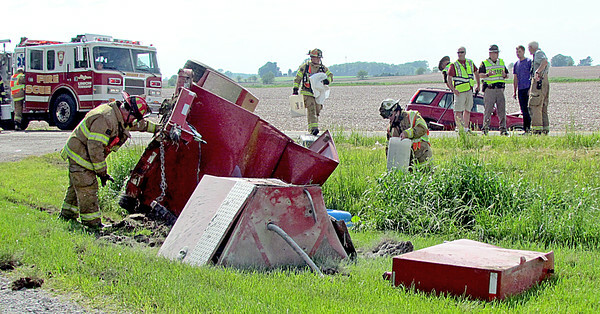 RURAL CRASH INJURES ONE: Firefighters from Lizton Fire Department set up booms in a side ditch next to an overturned trailer on state Route 39 at CR 375 S Friday afternoon. A pickup truck pulling the trailer, which was carrying 1,000 gallons of diesel fuel, was involved in a crash with a Honda CRV. The pickup's driver was taken to Witham Hospital, Lebanon, for treatment of unknown but non-life-threatening injuries. Center Township, Brownsburg and Pittsboro fire departments also responded. The crash shortly after 5:15 p.m. closed SR 39 in both directions for hours. Further details were unavailable at press time.